NBA season is getting ready to start and I’m super excited because it’s my most profitable sport by far. 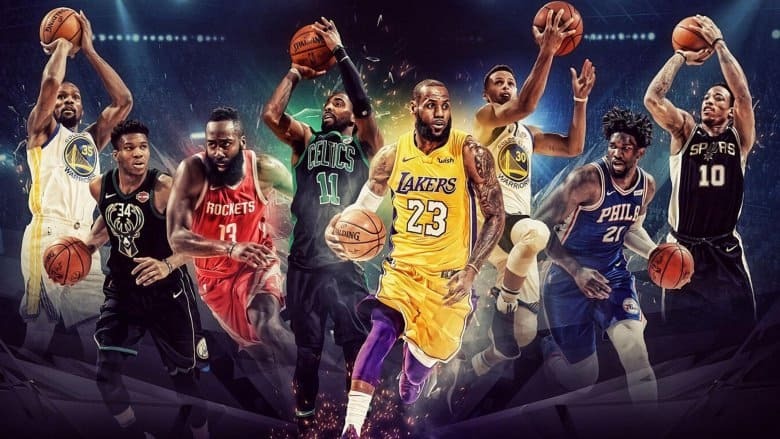 While it’s not as popular as NFL, NBA plays daily and requires extensive knowledge of different stats such as usage, home vs away splits, and defensive fantasy points allowed per position. Because of its technical knowledge, I think NBA is the easiest sport to profit from if you put in a little bit extra work. Coming off a decently profitable season, I will help you optimize your Fanduel NBA lineups and gain a distinct edge over your competition. Avg. Salary Range per Player – Floor ($3500), Ceiling ($12,000-variable). FanDuel no longer puts a cap on the salary range, but the highest is typically $11,000-13,000. Lowest Score is Dropped: To solve the ongoing problem of late scratches, Fanduel drops your lowest scoring player. 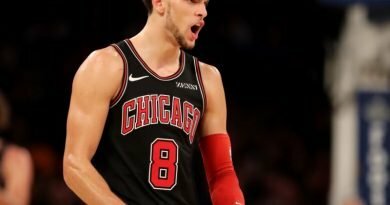 How Does Fanduel NBA Work? For starters, Fanduel gives you a salary cap of $60,000 to build a roster of 9 players. The roster consists of 9 players: 2 point guards, 2 shooting guards, 2 small forwards, 2 power forwards and 1 center. 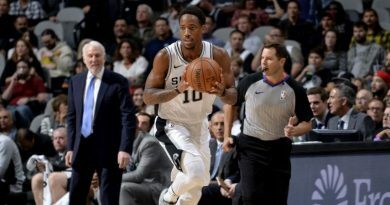 Each player’s salary is priced by Fanduel based on their recent performance and reputation (you’ll notice All stars like Stephen Curry and Lebron James are always priced higher than stars and role players). Before you start building your lineup, understand that you are given on average $6,666 per player so any player over $6,666 would be spending up for a player while any player under $6,666 would be spending down. This is crucial to understand at first because beginner players make the mistake of spending too much money on All Stars without allocating the rest of the salary cap on strong value players. There are two types of prize pools in daily fantasy basketball: cash games and tournaments. Cash games are head 2 head, double ups and 50/50 leagues where the prize pool is fixed. In head 2 heads, you need to score more points than your opponent to win. In double ups and 50/50 leagues, you only have to finish in the top 50% of entrants to win money. It’s easier to cash in 50/50’s but Fanduel rake will reduce your ROI a bit. For instance, if you bet $1 in a Fanduel NBA 50/50, you win $1.80 if you win. But for double ups, if you bet $1, you win $2. However, the top 45% of players cash in double ups while the top 50% cash in 50/50’s. For starters, I recommend going with 50/50 leagues because they are single entry games and much easier to win. One of the benefits of playing cash games is that it’s much easier to finish in the top 50% versus finishing in the top 20% to cash in tournaments. The downside is your upside is capped and even if you enter a super high scoring lineup, you will only double your money. For cash games, we want to target players who are consistent with a high floor. We’re not looking for boom or bust picks because you only need to finish in the top half to win. 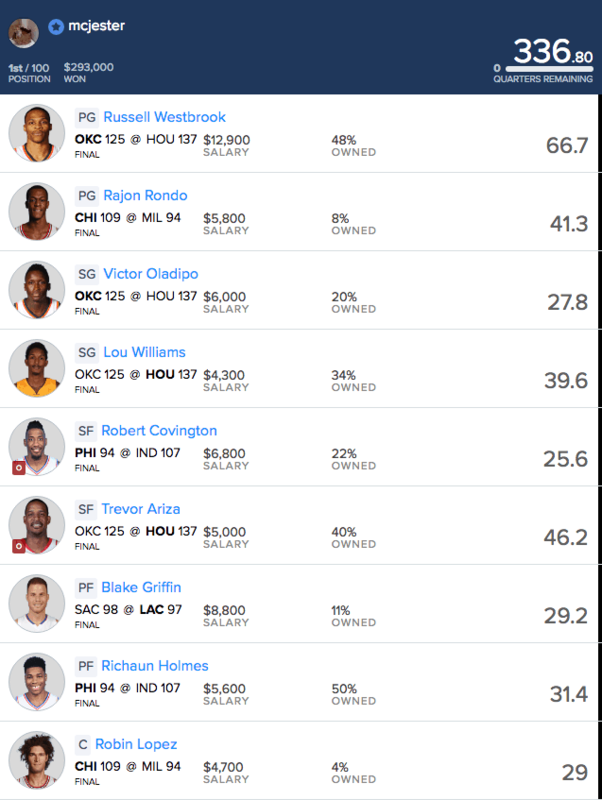 The best lineup builder strategy for cash games is to build a balanced lineup and avoid risky players who could tank your score. Tournaments have much bigger prize pools and attract a lot more entries because the top prize may pay out $100,000 or more. Fanduel runs a big daily tournament called the “Clutch Shot” with a top prize of $100,000 or more every night. The entry fee is around $4. There are two different types of tournaments: single entry and multi-entry. Single entry means you can only enter 1 lineup for the entire contests. 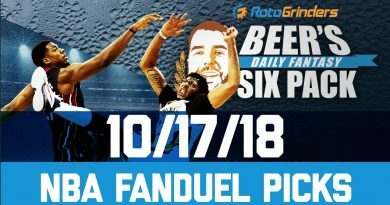 Fanduel runs a daily NBA single entry contest called the “$1 Dribbler”. Multi-entry tournaments have much larger prize pools and you can enter between 15 to 150 linupes. They are also harder to win because many DFS pros submit a lot of lineups and raise the average cash line. You must build a strong lineup to cash in multi-entry tournaments but it’s also where you will win the largest prizes. For GPPs, we want a roster of players who can “go off” and exceed their value threshold. You need a mix of players that go off and have solid scoring nights for their price tag. I’ll go over each position and show you how to score enough points to win your cash games and even take down some GPPs on a good night. PG can be a stud or value play depending on the night. We normally want PG’s that are playing against an uptempo team so they will get more possessions. Cheap value PGs are a great value against teams that play at a higher pace. Also, we are looking for PGs that get lots of assists, steals and points. Assists are really valuable at this position, so definitely watch out for Chris Paul and Kyrie Irving this season. If a starting PG get injured, then we can plug in whoever is starting in his place because he will be undervalued. This is one of the best moves to free up salary for a stud PF. Shooting guard is usually the weakest position on any given slate. It’s also a great place to punt the SG position. You can select a minimum salary guy that gets at least 30 minutes a game here. If you has a decent nice, you really give yourself a big advantage over your opponents. Sometimes, you want to pay up for a stud SG like James Harden so I like to pair Harden with a near minimum salary SG that will play heavy minutes. Small Forward is a good position to pay up for. Elite SF’s like Lebron James and Kevin Durant can go off for 50+ FDP in a given night. If you fade these guys, then your lineup is usually done for the night. Punting at SF is pretty risky so I usually will take 1 or 2 elite options to protect this position. One way to find value at the SF is to discover mispriced guys that are on a hot streak. The most recent example is Paul George who is currently on a hot streak yet underpriced across the industry. Power Forward is a great position to choose 1 stud PF like Anthony Davis then pair him up with a solid punt option. The reason is power forwards usually play under the basket and don’t have to move much to score or rebound. A minimum salary guy can easily pick up 8 points and 8 rebounds on an average night. We don’t want to punt both positions unless you plan to pay up for PG. Be careful with PF’s entering the lineup due to a starter’s injury. If he is a typical bench player, he won’t get much usage. I prefer playing guys that always get minutes because there is a lot less variance in NBA than any other daily fantasy sport. I like to roster a stud center like Demarcus Cousins or Dwight Howard. Simply because centers are a thing of the past in the NBA. Most of them have low usage rates and don’t score or rebound a lot. Plus, guys like Cousins can go off for 60+ FDP nights. Always take a stud center in a great matchup. He will get lots of rebounds and easy baskets. In order to win on FanDuel, you need to know what scores are needed when projecting players. Breaking down each position and category gives you the baselines needed to correctly project the players who will outperform their salary. The average player on FanDuel has a production-to-salary ratio around 4x, meaning that a player averaging 40 FP will have a $10,000 valuation. The key is finding players with as many positive factors going for them in a particular night, so you can achieve those 6-8x production multipliers you need to win. Research is the easy part because you have so many great resources available on NBA stats and projections. I published a list of the best Fanduel NBA research tools as well. Try to avoid overthinking my decisions and maintain emotional control until Fanduel locks lineups. Information is money in DFS. You need to stay on top of the latest information so you build lineups that are based on the latest news.